Can You Afford the House of Your Dreams? You're a recent graduate just striking out on your own, and you just looked at an amazing apartment with a city view just blocks from the subway. It's perfect, but can you afford it? Or maybe you're a first-time homebuyer, and you just fell in love with a bungalow with a great backyard and a beautifully updated kitchen. Is it in your price range? Two easy-to-compute ratios frequently used by financial planners provide a helpful starting point. The housing costs to income ratio tries to determine the percentage of gross pay that is devoted to housing costs. 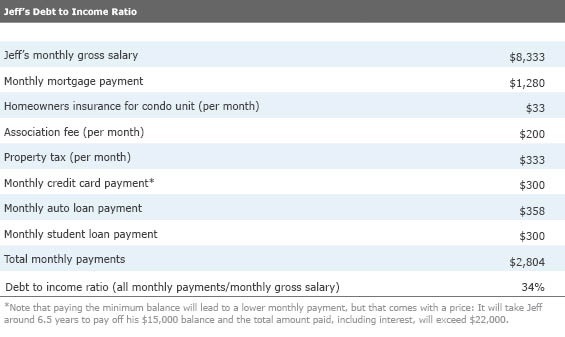 This ratio is basic: it includes your monthly rent or mortgage payment (principal plus interest), homeowners insurance, property taxes, and association dues, if you have any (you're most likely to encounter this in condos, townhouses, or coops). To illustrate, let's consider a single first-time homebuyer named Jeff. Jeff makes $100,000 per year, and he would like to buy a condo for $325,000. Can he afford it? This basic housing ratio is similar to the one that mortgage lenders use to determine if borrowers qualify for a loan. The upper limit for this basic housing ratio is usually 28%; as you can see, Jeff clears this hurdle. But remember that all of these inputs are subject to change. If your rent skyrockets precipitously, especially if that hike is not accompanied by a corresponding salary raise, it's probably a good idea to seek out a new apartment. But what if your mortgage payment skyrockets? During the housing bubble that peaked around 2006 in the United States, adjustable-rate mortgages were common. These lending arrangements usually give the borrower a fixed period of lower monthly payments, at a low "teaser" interest rate, in exchange for the lender taking on interest-rate risk over the remainder of the loan. Sometimes borrowers with low or no down payments can qualify for mortgages with these artificially low rates. After the initial introductory period expires, the borrower will often be on the hook for a higher monthly payment and monthly private mortgage insurance payments as well. If the housing costs to income ratio were to be calculated using this low introductory rate, there's a good chance that the homeowner could afford the home in the short term but not over the long haul. To make matters worse, during the financial crisis that followed the U.S. housing bubble, home prices crumbled as many of these low introductory rates were expiring, foiling many homeowners' plans to sell property before the rate adjusted. Many homeowners were "underwater" on their mortgage loans, meaning their remaining loan balance was more than what the home’s resale value. Therefore, selling the home to get out of paying the higher monthly payment wasn't an option unless the homeowner could come up with the cash to repay the loss to the mortgage lender. Of course, you can't control the variations in your home's market value, but you can take steps to protect yourself from the scenario I just described. If you have an adjustable-rate mortgage, make sure you run through a worst-case scenario using the maximum rate allowed according to the mortgage contract (sometimes called the "lifetime adjustment cap"). Every mortgage lender is required to provide the homebuyer with a truth in lending agreement; it's a document that details all the interest you will repay over the life of the loan and the total payments you will have made if you pay the mortgage for the entire lending period. In the case of an adjustable-rate mortgage, the truth in lending statement will include a worst-case amortization schedule and monthly payment. If you can't find this, it pays to do some number crunching yourself to see if you could handle the maximum potential risk. If you want to get a more holistic view of how much you can afford to pay for housing, you may want to consider your debt to income ratio. This is calculated just like the housing ratio, but it also takes into account all monthly debt payments, such as credit card debt, student loans, auto loans, and any other debt payments made on a monthly basis. Let's assume Jeff has a $15,000 balance on a credit card with a 15% interest rate, and he is making the minimum payment each month. On a $15,000 balance, the minimum payment is usually figured as a percentage; often it's 2%. Let's say Jeff also recently took out a $20,000 loan to purchase a car (2.9% annual percentage rate for 60 months), and he has a $300 per month student loan payment. Jeff's debt to income ratio is 34%; how does that stack up? The rule of thumb or industry benchmark for this ratio is 36% or below, so by this metric, Jeff would still be OK taking on these housing costs. However, many financial planners would look askance Jeff's minimum monthly payment on a $15,000 credit card balance. In fact, a conservative planner might instead run the debt to income ratio using a monthly payment that would retire the credit card debt in three to five years. Let's recalculate the debt/income ratio with a more aggressive credit card repayment plan designed to get Jeff out of credit card debt within four years. 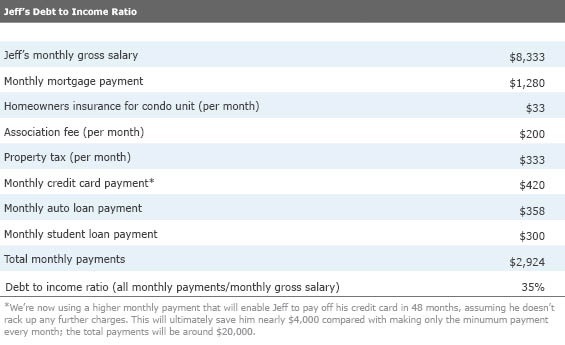 Since Jeff is still under that 36% benchmark factoring in a more aggressive credit card repayment plan, chances are that he can afford to buy the $325,000 condo. But even the debt to income ratio doesn't take into account all of Jeff's expenses. In order to ensure he doesn't fall into debt trying to make ends meet, he should also consider taxes, insurance, and utilities (including cell phone costs), as well as his budget for groceries, entertainment, travel, and more.